[5:1] Now concerning the times and the seasons, brothers, you have no need to have anything written to you. For you yourselves are fully aware that the day of the Lord will come like a thief in the night. While people are saying, “There is peace and security,” then sudden destruction will come upon them as labor pains come upon a pregnant woman, and they will not escape. But you are not in darkness, brothers, for that day to surprise you like a thief. For you are all children of light, children of the day. We are not of the night or of the darkness. So then let us not sleep, as others do, but let us keep awake and be sober. For those who sleep, sleep at night, and those who get drunk, are drunk at night. But since we belong to the day, let us be sober, having put on the breastplate of faith and love, and for a helmet the hope of salvation. For God has not destined us for wrath, but to obtain salvation through our Lord Jesus Christ,  who died for us so that whether we are awake or asleep we might live with him. Therefore encourage one another and build one another up, just as you are doing. The day’s lesson states that the week’s passage is proclaiming the need for “readiness” in light of the return of Jesus and the judgment that entails. 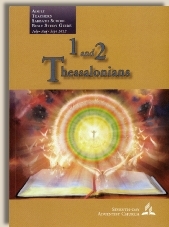 The author surmises that many were probably living without a sense of urgency and that others were, perhaps, trying to calculate when the day would come, but Paul is urging the Thessalonians not to lose their sense of urgency or to get distracted by calculations or apathy. In context, Paul is not encouraging a sense of urgency. To be sure, within Adventism the discussion of the coming Day of the Lord elicits fear and urgency. In the context of writing to born again believers, however, there is no need for “urgency” regarding the Day of the Lord. Paul is, on the contrary, reassuring the Thessalonians that because they are walking in the light, the coming Day does NOT need to surprise them as a thief in the night (v. 4). The author of the lesson theorizes that members of the church were developing “a theology of ‘peace and security’”. Yet in the context of the passage, it is not church members whom Paul says will be saying “peace and security”, but the world. Paul is very clear that the church is not in darkness, and “that day” should not surprise them like a thief in the night. This is a passage of reassurance, not a passage of alarm. Paul ends it with a call to be sober and awake, aware of what is happening. He describes the desired sober awareness as being characterized by standing in the “breastplate of faith and love” and the helmet of “the hope of salvation”. Paul further reminds the Thessalonians that God has not destined (note the tense: it is already decided) believers who are born again for wrath. Rather, He has destined believers to obtain salvation through “our Lord Jesus Christ, who died for us so that whether we are awake or asleep we might live with him” (v. 9-10). The lesson does not point out that verse 10 says that believers who are “asleep”, meaning dead, are nevertheless able to live for Him. In other words, when a believer dies, he does not cease to exist but is with the Lord. His spirit, made eternally alive because of his belief in Jesus, goes to Him and continues to live with Him even though the body is dead. This passage is not a call to “urgency” but a reminder of the believer’s security. When we believe we pass at that moment from death to life and do not come into judgment (Jn. 5:24). Paul is reminding us as born-again believers that we must be sober and awake, noticing the signs of the times and standing clad in faith, love, and the assurance of salvation. We do NOT need to fear, and That Day will not overtake us like a thief because we are not in darkness. We are people of the light. This passage is not a call to urgency or fear. This passage differentiates between the unbeliever for whom That Day will come like a thief, and the believer who will not be surprised by it. Believers are children of the light, not the darkness, so they will not be surprised. Believers are to be sober and awake, standing clad in the armor of faith, love, and salvation. Moreover, because of Jesus, believers will live with Jesus whether they are dead or alive. Their spirits have already passed from death to life and do not cease to exist at death. Paul is encouraging the church; he is not whipping them up to a fever pitch of urgency. That Day is fixed, and if one is born again, he has nothing at all to fear.